The demands for mechanical engineering are as complex as the wishes and goals of our customers. Therefore is your wish our goal, to create a product, which exceeds your expectations. We are specialised in the production of up coilers, tube joiners, flying saws, control-, straightening and drawing machines whose construction and development show our motivation and professionalism. 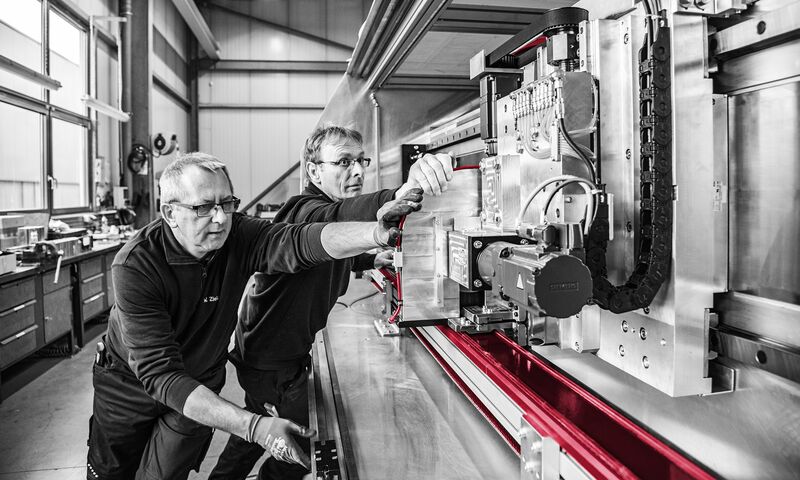 Next to competent manufacture, we focus on modern production methods and top teamwork. The demands of the tube industry, concerning their machines and products, grow steadily. The tasks should be managed faster and more powerful at constant quality. We know of this challenge and are convinced: our machines are up to the job. The rewinder can wind tubes specifically over a drum or over transporting rolls with a bending roll. The cutting of the tubes takes place at the bending roll or through scissors. At the transport rolls the cutting is realised with a cross-cutter. Optional it is possible to put a handling with a tube inspection in front of the upcoiler. Faulty tubes will be cut out this way and stored separately over the handling. Collecting fingers secure the tubes while changing the baskets or while separating the faulty tubes. The liquidator organises the up and down winding of tubes with the attached dancing control and guarding. A double protecting door for loading and discharging of the baskets is available in the liquidator. The tube joiner guarantees a seamless tube-to-tube production without system downtime. The inspection machine regulates the modular tube inspection with all clamping units. The material inspection is professionally organised by the inspection machine, so that a unique quality is maintained. Through the straightening machine tubes are undergoing a length measurement with measuring rolls or a laser. The straightening machine is qualified for the tube transport or the start-stop operation. The flying saw can cut up to four material lengths consecutively and non-order related, even at high speed. Faulty tubes that were recognised at the inspection machine are cut out of the tube production with optimal remaining-length usage. The discharge can be stored separately through the tube sorting. The flying saw – round can realise round material lengths at the tube production in high speed. Acceleration to 3G with a saw head weight up to 1to. The flying saw- rectangular tube can realise rectangular material lengths at the tube production in high speed. Acceleration to 3G with saw head weight up to 1to. The tube sorting takes place after the cutting of the flying saw. There, the material lengths as well as the faulty tubes are sorted out on four storage places. Through a drum with a rolling drawing-die take up and a cooling basin the drawing machine guarantees a flawless drawing of the tubes.